H16 — the H16 series has a presloped seat of 5/12 for double trusses. The presloped seat of the H16 provides for a tight fit and reduced deflection. The strap length provides for various truss height up to a maximum of 13 1/2" (H16 series). Minimum heel height for H16 series is 4". HGA10 — the HGA10 attaches to gable trusses and provides good lateral wind resistance. 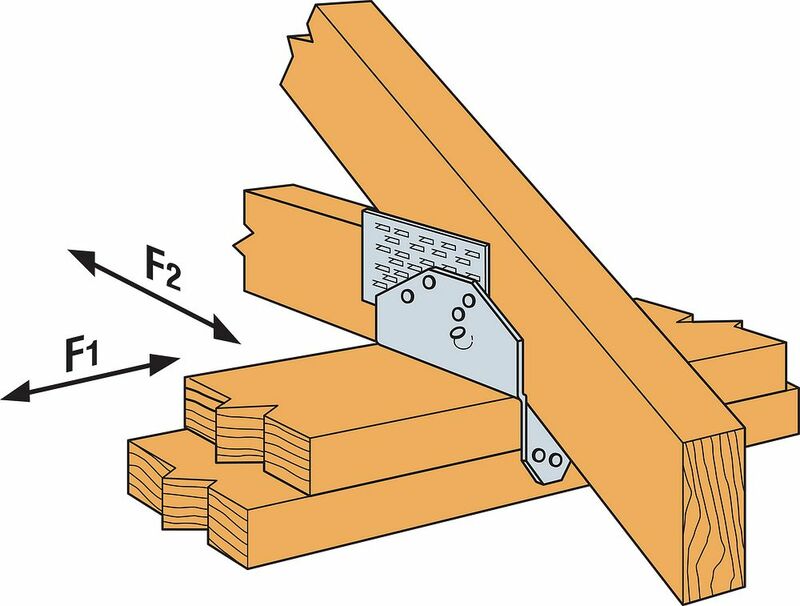 HS24 — the HS24 attaches the bottom chord of a truss or rafter at pitches from 0/12 to 4/12 to double 2x4 top plates. Double-shear nailing allows for higher lateral resistance. Galvanized. Some models available in stainless steel or ZMAX® coating. See Corrosion Information. H2.5T, H 3 and H6 ties are shipped in equal quantities of right and left versions (right versions shown). When installing ties on plated trusses (on the side opposite the truss plate) do not fasten through the truss plate from behind. This can force the truss plate off of the truss and compromise truss performance. H10A optional nailing to connect shear blocking, use 0.131" x 2 1/2" nails. Slots allow maximum field bending up to a pitch of 6:12, use H10A sloped loads for field-bent installation. HS24 requires slant nailing only when bottom chord of truss or rafter has no slope. See also H seismic and hurricane ties for masonry applications. HGA10KT: sold as a kit with (10) HGA10 connectors. Strong-Drive® SDS Heavy-Duty Connector screws are included. Additional screws sold separately to install with all SDS25112 screws. Hurricane ties are shown on the outside of the wall for clarity and assume a minimum overhang of 3 1/2". Installation on the inside of the wall is acceptable (see General Instructions for the Installer, note "p" on p. 18). For uplift continuous load path, install connectors in the same area (e.g., truss-to-plate connector and plate-to-stud connector) on the same side of the wall, unless detailed by designer. See technical bulletin T-C-HTIECON for more information. Some load values for the stainless-steel connectors shown here are lower than those for the carbon-steel versions. Ongoing test programs have shown this also to be the case with other stainless-steel connectors in the product line that are installed with nails. Visit General Corrosion Risks for updated information. 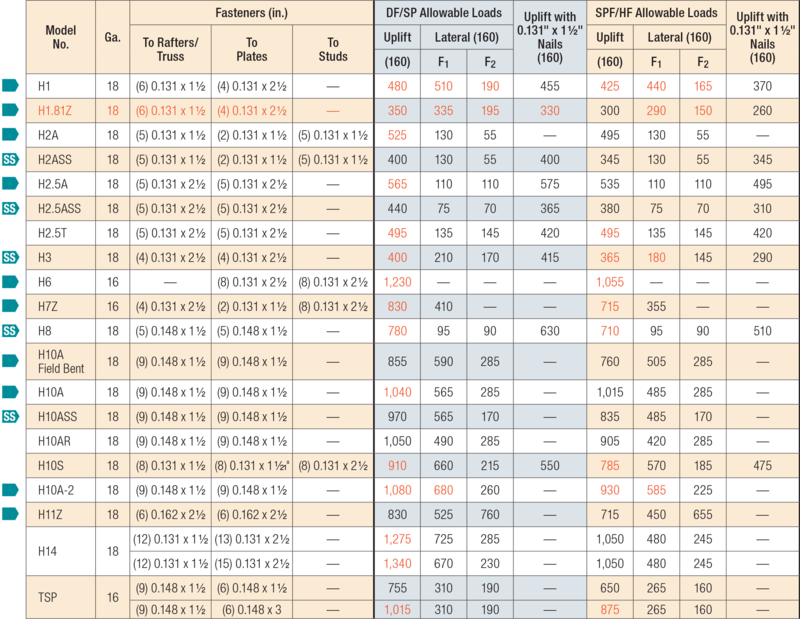 HS24 DF/SP allowable loads without slant nailing are 605 lb. (uplift), 590 lb. (F1), 640 lb. (F2). For SPF/HF loads multiply these values by 0.86. 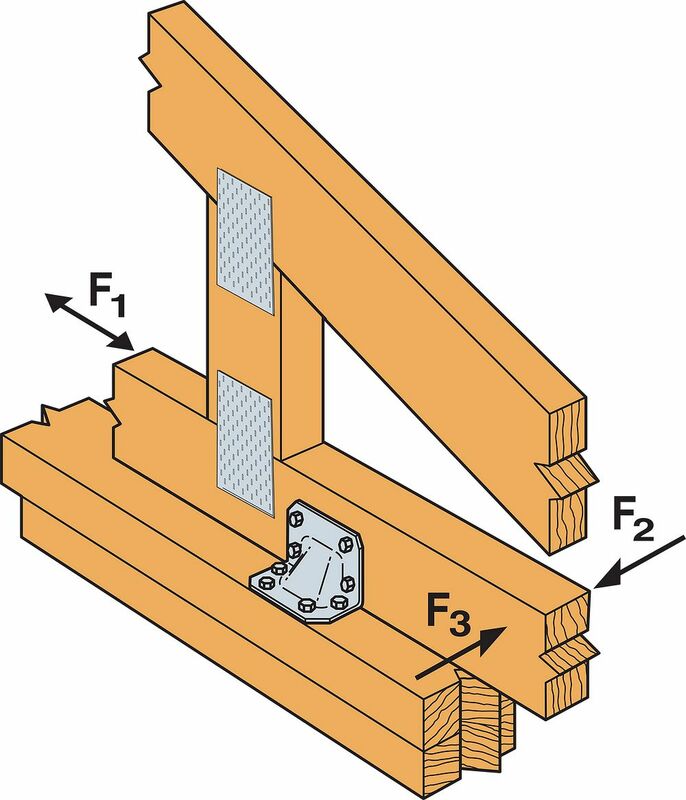 Allowable loads in the F1 direction are not intended to replace diaphragm boundary members or prevent cross-grain bending of the truss or rafter members. Additional shear transfer elements shall be considered where there may be effects of cross-grain bending or tension. H10ASS uplift load for southern pine with SSNA10 nails is 1340 lbs.